Since the development of WhatsApp, the WhatsApp developers have been working on continuous improvements in the instant chat application to provide the users with better features with the passage of time. The most remarkable features released so far are End to End Encryption, Voice and Video Call, Message Seen Notifications but the new feature on which the developers are working on is the most interesting one and allows users to share location with friends under ‘Show my Friends’ option in the group settings. 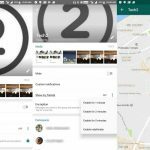 With the help of this new feature, users will be able to track the location of their contacts and will be able to guide about possible short paths to take in case of traffic scenarios. So whenever there are meet up plans and get together, the group of people involved will have a complete coordination about the whereabouts of fellow members. The feature will be synchronized with Google Maps and will provide a Satellite and Terrain view. The feature will be disabled by default and users have to enable it to allow location features thus ensuring users privacy concerns. The location can be enabled for two, three minutes or for indefinite amounts of time. So now there will be no more excuses on reaching late. The feature tends to appear in beta versions and is expected to roll out once tested against all bugs and errors.